We have looked at several factors that affect the SEO of web pages, like titles, headings, URLs, content and so on. 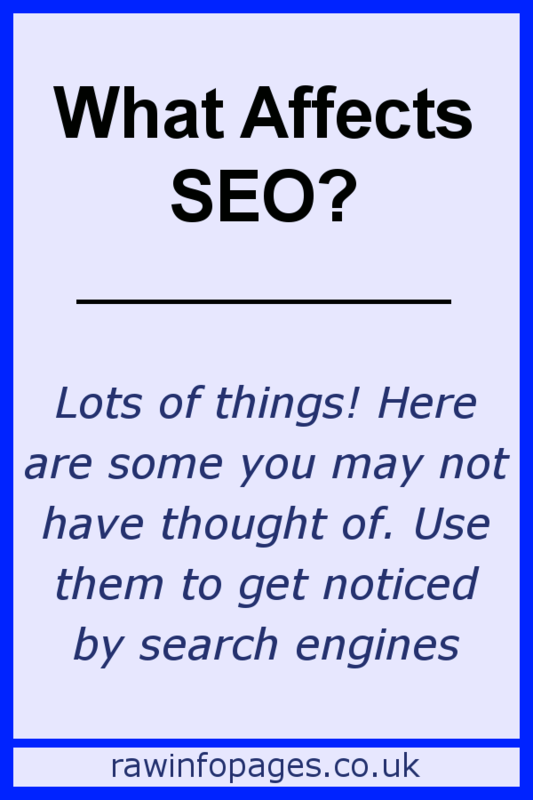 What else affects SEO? Here are some other factors to consider. How easy is it for people to navigate your website? Can they easily find pages and posts? The easier you make it for people to find your content, the easier you make it for search engine crawlers to discover it. Think about the menus that your site has. Can every page and post be found on one of those menus? If there are any that are not on a menu, how will people and search engines discover them? The depth of an article is something to think about and this means the number of clicks it takes to get to an article from the home page. For example, click a menu on the home page and it might take you to a section, click a link there and it could take you to another section, then there may be a list of pages to click. You have to click, click and click again. If you have to click through too many menus and links, you might lose visitors. Search engine crawlers don’t give up so easily, but generally what is good for visitors is good for search engines. Keep the number of clicks required to get to articles to a minimum. Use menus to organise content so that one click goes to a section on your site and then one more click opens an article. Also make sure that a link to every article can be found one way or another. The content on a website should be organised using categories and tags. These together are sometimes called the taxonomy. It probably isn’t a big factor affecting SEO, but adding tags and categories is very easy and everything helps SEO a little. What is a category and what is a tag? The easiest way to think of these are in terms of a nonfiction book, such as a textbook or manual. The contents at the front is like the categories feature in WordPress and the index at the back is like the tags. Categories are broad and if you had a website that contained recipes, you might have categories like Breakfast, Lunch and Dinner. When a recipe is added to the site, it can be assigned to one of these three categories. When someone wants to see all the dinner recipes, they can view the Dinner category – menus can be added to list all posts within a category. The display of tags and categories depends on the theme. They may or may not be visible, but you can always create links yourself or add menus to display categories and tags. 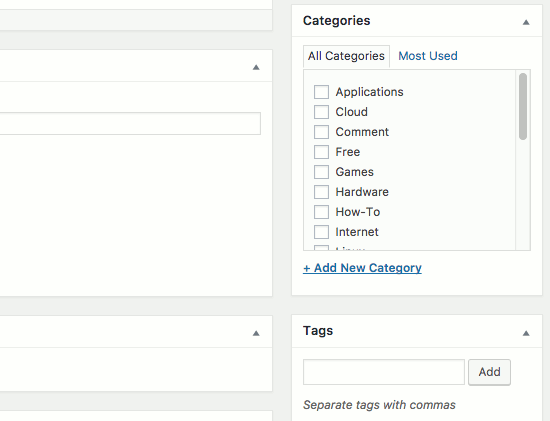 Use the widgets in the sidebar in WordPress to add categories and tags when writing an article. There is a link to add a new category, and tags accept any word that is entered. 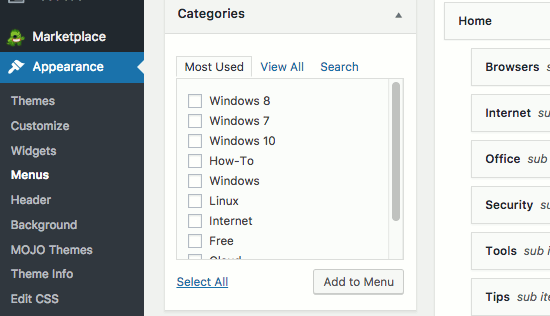 To add a category to a menu, select Appearance in the sidebar and then Menus. Tick a menu and then click Add to Menu. If the menu is added in the wrong position, just click and drag it up or down the menu items list. It is easy for categories and tags to become a disorganised mess. If you are just starting out with a website it is the perfect time to plan what categories and tags you will use. It is a lot harder when you have 100+ posts and think, “I need to get this organised with categories and tags.” It is a lot of work to go back and change everything. Try to limit the number of categories and remember that they are broad groups. There are usually more tags than categories and that is OK, but don’t get carried away. When a post is created, the combined number of categories and tags that are associated with it should be less than 10. Very large numbers might have a negative effect on SEO. If you have external links to good quality, high ranking websites, it may help a little with the SEO. There is some debate over this, but it certainly does no harm and it might do some good. It is best to include links to reputable sites. However, it is important to use the link within the context of an article. Placing links in a post for no reason is a bad idea and if there are a lot of them it can have a negative impact on SEO. Make sure there is a good reason to link to an external site and make sure that the text of the link is describes who/what/why you are doing it. Bad links are bad for SEO. For example, if you send people to websites that engage in illegal activities like pirate software, music and movies, it will negatively affect SEO. If a site you link to is known for malware, spyware and similar things, it will negatively affect SEO. Don’t do it! Web browsers like Chrome block access to websites with bad links and you don’t want that to happen! An internal link is one that points to another page on your site. This is useful for several reasons and on is that it helps visitors and search engines to find related content. The search engine crawler can follow internal links and discover other pages on your website. Several articles all on the same subject and all of which link to each other can be a valuable resource for visitors. It is also good for SEO too. Search engines like Google love new content that is different, unique and has the information people are looking for. As a web page ages though, search engines might assume that the content is less relevant. For this reason old pages can lose some of their ranking and are less likely to appear in search results. They then get less traffic from search engines, which means they aren’t as popular, so are less likely to appear in search results. It is a downward spin, but there is a way to maintain the ranking of old pages on your website. Refresh them! Select All Posts in the WordPress sidebar and go to the last page of posts. Find an old post by looking at the Modified date and edit it. There are always a few tweaks you can make to the text and you might find a better way to say something or even discover a typo or two that slipped through. Is there any new information you can add to the article? An update? Something you discovered since writing it? Even adding just one paragraph can be useful for boosting SEO. Check all the images and make sure they have full descriptions. You might not have been doing this at the time.